Wimbledon could be set for its first British winner in the Men’s singles since Fred Perry in 1936 after Andy Murray’s odds to win the All England competition were slashed. Murray – who finished runner-up in South West London last year – has been moved from 3/1 to 11/4 to win his first Wimbledon title this summer. The Scot overcame Croatian Marin Cilic 5-7 7-5 6-3 in West Kensington to give his grass season hopes a timely boost. Rain delays and an injury scare meant the 26-year-old’s third successive Queen’s title was no straightforward affair, but Murray grew into the final and eased to success in the capital. Novak Djokovic remains the favourite at 15/8 for Wimbledon glory, with Rafael Nadal at 3/1 behind Murray. One man worth watching is seven-time Wimbledon champion Roger Federer, whose ATP Gerry Weber Open tournament win has seen his odds inch in from 6/1 to 11/2. And Jo-Wilfried Tsonga – who lost to Murray in the semi-finals at Queen’s – is a 14/1 bet to win Wimbledon, having made the last four in London in both 2011 and 2012. 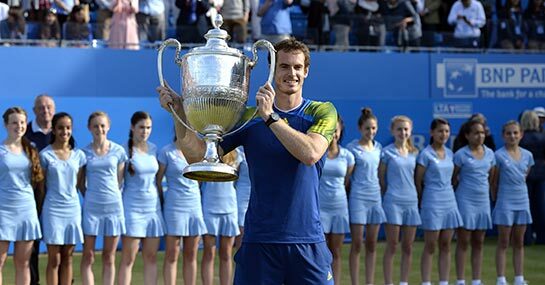 But Murray’s Aegon Championships victory will increase the national fever surrounding 2013’s British Grand Slam – that has Murray at just even money to reach the final for a second year in a row. There is a 5/2 chance that he successfully defends his US Open title in September at Flushing Meadows in New York, but for now Murray’s focus will be closer to home. The Dunblane-born star can be backed at 10/1 to win both Wimbledon and retain his US Open this campaign, while punters fancying him to secure three Grand Slams in 2014 is a long 25/1 shot. Murray will be confident going to SW19 this season after just missing out to Federer in 2012, and winning the Olympics at the same venue coupled with his recent Queen’s success. Ladbrokes will be refunding all losing outright bets (as a free bet up to £25) if Andy Murray is finally victorious at Wimbledon this year. Available in shops, online and mobile.